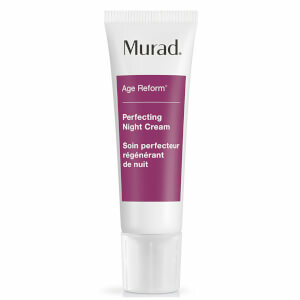 Rejuvenate your skin as you rest with this Murad Age Reform Perfecting Night Cream. This intensive hydrating cream nourishes and rejuvenates skin overnight by restoring lost moisture and promoting a healthy cell turnover. Age Reform Perfecting Night Cream from Murad contains essential fatty acids to protect skin's barrier and prevent moisture loss; sunflower oil to increase skin elasticity and suppleness; as well as green tea and vitamin E to help rejuvenate your skin and prevent it from being damaged. Apply to freshly cleansed and toned skin. Massage evenly over you face, neck and chest.